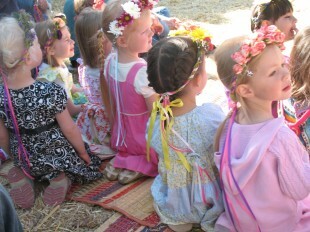 May flower crowns in plaited hair, the young girls watched admiringly as the older children danced around the May Pole. Ribbons of pink, blue and yellow being woven around the pole ever so skillfully as the warm May sun shone overhead, finally warming our shoulders. Late spring unfolding its wealth of colors, the birds were joyfully singing from the trees. 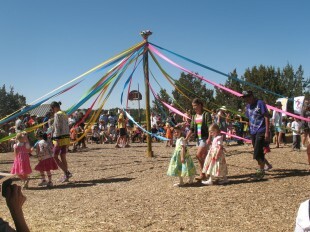 The gift of a simple dance with ribbons around a pole. To a child, this is pinnacle. Bursting with bounty and color, nothing was lost on the children. Full of the child’s wonder, I was reminded why we create such ceremonies. We create them to remind us that we are human. Humans bursting with life and creativity, if we make the effort. The warmth of May revives us in this way. It reminds us of our vitality. It reminds us why we keep creating, why we keep dancing. It is our great reward, to be able to frolic and celebrate. It is a relief. I feel that my duty as a parent is to keep these simple joys and ceremonies alive for my children, customs free of popular culture norms and our ever so fast modern lives. Children understand these simple blissful celebrations and are comfortable in them, if only given the chance to have the experience. Children are our jewels and we must protect them appropriately, letting beauty guide them through life. If beauty is their guide, they will become beauty. Their embodiment of beauty can only multiply. Oh, I love the neatly plaited on a very special girl! Thank you for bringing me along to this sweet day, and for your reflections on creativity, celebration, and parenting.